Fort Thompson, S. D.—The U.S. Army Corps of Engineers will inspect the spillway structure at Big Bend Dam July 1. 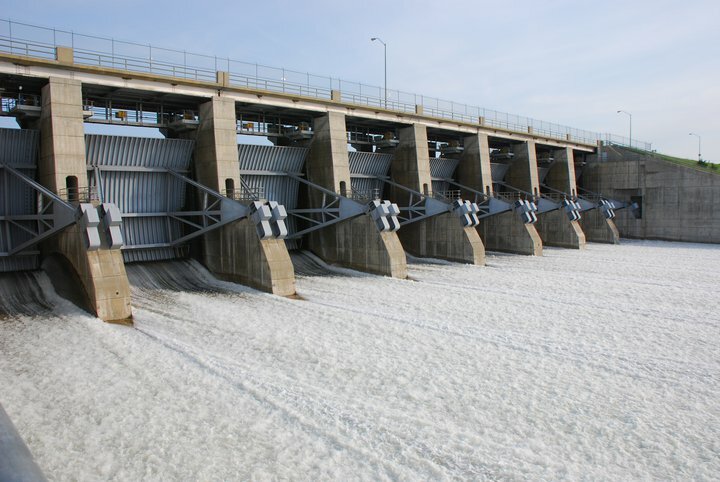 Spillway gates will close so that personnel can inspect the concrete apron, wing walls and dissipation pillars via boat. One of the tools that will be used during the inspection is a side scan sonar system since portions of the spillway structure are out of view, underwater, said Operations Project Manager Keith Fink. The purpose of the inspection is to assess the spillway’s performance after recent, prolonged water releases. The inspection should be completed July 1. For general questions regarding our flood response information efforts, please call (402) 996-3877, (877) 214-9110 or e-mail us at MRJIC@usace.army.mil. Follow us on Facebook(www.facebook.com/OmahaUSACE),(www.facebook.com/OperationMightyMo ), Twitter (www.twitter.com/OmahaUSACE ),YouTube (www.youtube.com/OmahaUSACE ),and FLICKR (www.flickr.com/OmahaUSACE ) for the latest updates regarding our flood response operations. You can also find flood inundation maps and local emergency management contact information on our social media sites as well as our district Web site at http://www.nwo.usace.army.mil. (NaturalNews) The American public is largely being kept in the dark about the escalating Midwest flood disaster, which has now been further intensified by reports that a major nuclear plant near Omaha, Neb., has been breached by flood waters. A few weeks ago, NaturalNews reported that an electrical console at the Fort Calhoun Nuclear Facility had caught fire, and that the plant's nuclear cooling pools had subsequently lost power for about an hour (http://www.naturalnews.com/032672_n...). Now, an AquaDam berm around the facility has reportedly been mysteriously punctured and deflated, which has sent several feet of flood water directly into the plant. The unfolding situation at Fort Calhoun reads a lot like the Fukushima disaster. Officials have been downplaying the severity of the situation from the start, and yet it has only continued to get worse, despite their empty promises. First it was the fire, then the loss of power, then the establishment of a no-fly zone around the plant, then the breaking of the berm, and now the apparent flooding of various facilities with no end in sight. A ten-mile evacuation zone has also been declared around the plant, despite the fact that little to no information about it can be found online or in the news (http://blog.alexanderhiggins.com/20...). According to a recent report by ENENEWS, flood waters have actually cut off the main power supply at the plant, which is now running on backup diesel generators (http://enenews.com/ft-calhoun-nuke-...). Without power, of course, the plant's electrical systems will be unable to properly cool both the reactors and the spent fuel rods, which reports say are not effectively protected from flood waters (http://www.prisonplanet.com/berm-pr...). The following video clip from KJKN-TV ABC 8 News in Lincoln, Neb., tells a sobering story all on its own. In it, you will see shocking, recent images of the Fort Calhoun plant completely submerged under water (http://www.youtube.com/watch?v=_zos...). And like they did during the early days of Fukushima, officials here continue to repeat the mantra that everything is safe, and that nothing will go wrong. But based on their track record of honesty -- not to mention the obvious disastrous conditions at the flooded, powerless facility -- can they really be trusted? Much of the snowpack from last winter's heavy storms has yet to melt, and what has already melted is responsible for much of the intense flooding that is currently taking place all across the Midwest, including in the Canadian provinces of Manitoba and Saskatchewan, and throughout the US states of Montana, North Dakota, South Dakota, Iowa, Nebraska, Kansas, and Missouri. With more snowmelt and water surges on the way in July, as well as continued heavy rain and storms across the region, rising flood waters are far from over -- and the already-at-capacity dams and levees that line the Missouri and Mississippi Rivers will more than likely not be able to hold it all (http://www.cbc.ca/news/canada/manit...). At this point in time, there are still a whole lot of questions without answers. Why is the mainstream media spending most of its time focusing on corrupt politicians and upcoming election candidates when what appears to be the worst flood situation ever to hit North America is unfolding as we speak? 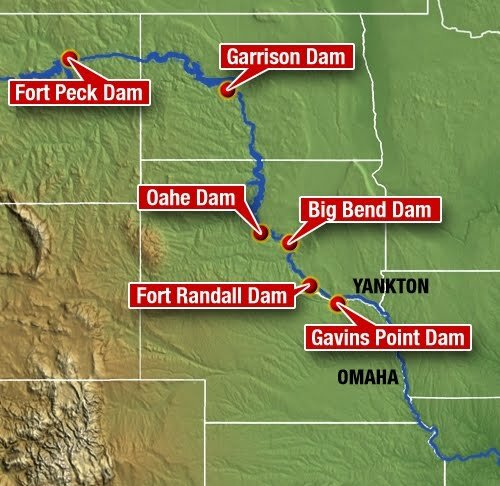 Why is nobody talking about the four major reservoirs along the Missouri River held by dams that are all virtually at maximum capacity and in dire straits? And why is there practically no mention by any major, or even local, news sources about the Fort Calhoun evacuation zone? Those living along the river, and particularly in areas near the troubled nuclear facilities, may want to perform due diligence and prepare immediately for a worst-case scenario. It is clear that authorities and the media are not being forthcoming about what is actually happening, and they may flat out be lying to us all. With this in mind, it is important to be prepared for a worst-case scenario. Stay tuned as we will do our best to mine all available information about this escalating crisis as it becomes available, and present it to you, our readers, for consideration.